The runner-up was a near tie between Kleeger and IndulgeMe’s pillow, which are quite similar: two-paneled pillows with antibacterial mesh, 4 suction cups, and enough padding to make them comfortable. However, IndulgeMe’s pillow comes with a 10-year warranty, as well as an extra Konjac sponge (made of bamboo charcoal) and is just about the same price. This gives it the edge. For a full review of the IndulgeMe, see the Product Reviews section below. A hot top pillow can be a great accessory to add to your tub for greater comfort. You may also want to consider picking up some hot tub steps, and perhaps a spa side table. With all that, you’ll be ready for a hot tub party! In this section, we’ll take a look at all five of the hot tub pillows we’ve selected to look at. We’ll start with a comparison table to get the lay of the land, and then look in depth at each one individually before wrapping up by identifying our favorites. A light, supportive pillow built with comfort in mind, created with a special antibacterial mesh to help prevent mold and mildew. Pillow comes with a 5-year warranty. Contact Kleeger directly for any questions. The first thing to note is that Kleeger’s hot tub bath pillow was created to allow water and air to flow through it. This gives the pillow the ability to dry quickly, and when combined with the antibacterial mesh, allows it to stay free of mold or mildew – if you follow a few simple steps. While being resistant to mold and mildew, the Kleeger pillow can still be impacted by mildew if it’s not regularly cleaned. The recommended approach is once every two weeks if you’re using it regularly. First, let it soak in dish soap and water for 15 minutes before gently cleaning by hand so as to not damage the mesh component. Then, leave it until fully dry – then it will be good to use again. Some reviews have reported their pillow getting mold in as little as a year even with air drying it, so it’s important to maintain a consistent cleaning schedule if you are regularly using it. The suction cups help to keep this pillow hold firm against the side of the hot tub. Just be sure to press them firmly on. Many find that the pillow can get heavy when it’s water-logged and has a tendency to slide down if not well secured. This is a reasonable, multi-purpose bath pillow to purchase if you don’t mind a bit of upkeep. It can be used as a seat, headrest, or full body pillow to suit a variety of needs. It’s pretty comfortable and works in any hot tub or bath environment. A simple hot tub headrest that works well as a budget option. It’s somewhat specifically tailored to go with an Intex Purespa, but can be used with other tubs. Intex’s headrest sits at the top of the lip of the hot tub. One of the unique features of this headrest is that it can be filled with air, water, or even sand to adjust the firmness. Intex recommends that it be filled at least somewhat with water to ensure that it is stable atop the side wall. Compared to Kleeger’s pillow, this headrest will require considerably less maintenance, given that it is not made of mesh material. Water from the hot tub can’t flow into it, just the water you add specifically. It may be smart to drain the water and rinse it out inside each time you empty and refill. Otherwise, a light scrubbing should help every month or so if while it’s getting regular use. Some buyers find that it is difficult to get the headrest to stay steady on the side of the hot tub, which can be quite annoying! 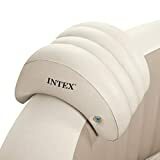 Intex recommends filling the spa pillow partially with water to help hold it down, but besides that, there doesn’t seem to be any other mechanism to help keep this headrest firm on the hot tub. The stability issue is certainly the biggest problem with this pillow, and there are no other major issues to report. The Intex Spa Pillow is a reasonable budget option if you are just shopping for a simple headrest rather than a full pillow. A cushion primarily designed as a booster as opposed to a head pillow. This pillow can help make your hot tub experience more comfortable and enjoyable – if you are able to keep it from floating away. Contact Belize directly on Amazon if you need information regarding their warranty. 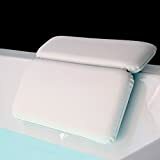 This hot tub cushion by Belize has a few features that make it easy to use – like the side handle straps, unzippable outer cover for washing, and an easily drainable core component when not in use. All these are great features! However, its functionality as a seat cushion makes it hard to recommend. One of the more common experiences with this cushion is that it is challenging to keep the pillow down at the bottom of the hot tub – even when people are sitting on it! The Belize cushion has a tendency to want to float, making it difficult to serve its purpose at times. There is a simple solution though if you are finding yourself in need of a cushion. A lot of people choose to keep the pillow in the hot tub all the time. The cushion eventually gets completely saturated with water, helping to keep it at the bottom of the hot tub. Unfortunately, this solution has a downside of its own. By leaving the cushion submerged all the time, some buyers find that decay or mold sets in more quickly. However, regular cleaning can reduce the impact that mold can have on this seat. There is little consensus on this cushion. Some find it compresses too easily and ends up only providing a couple of inches of boost and cushion. Others find it provides significant comfort and utility. A bit of work on the owner’s end can make any problems this cushion might have pretty negligible. For its price range, the Belize booster hot tub cushion is a solid seat that one can be comfortable purchasing. Just keep in mind the floating away issue, and be sure to submerge the cushion completely for several minutes before use. 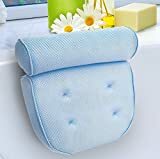 15"W x 12"L x 5"H.
A bath pillow that is easily secured to any tub via its 4 suction cups, with its main features being antibacterial mesh and an extra sponge. IndulgeMe backs up their pillow and sponge offering with a 10-year warranty. Contact them directly on Amazon for more information. Most similar to Kleeger’s hot tub pillow, IndulgeMe’s looks nearly identical except for its color: a clear white. Like the Kleeger, the IndulgeMe also includes four suction cups, is made of antibacterial mesh, and a breathable overall material that allows water and air to easily flow through. IndulgeMe has a much better brand name, though. Who doesn’t want to be indulged in a spa environment?! Like Kleeger’s design, the IndulgeMe cushion does need some regular cleaning and maintenance to keep it looking good. The IndulgeMe requires regular cleanings every 2 weeks (with soap). It should also be removed from the tub when not in use in order to allow the pillow to air dry. Otherwise, the pillow may become prone to mold and mildew despite the company’s best attempts to prevent that. The sponge, which is made of bamboo charcoal material, is a nice addition for exfoliation and skin cleansing. 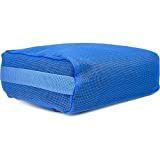 This pillow is essentially identical to Kleeger’s hot tub bath pillow covered above, except its packaged in with the sponge and has an additional 5-year warranty (for a total of 10). The IndulgeMe does come at an ever so slightly higher price, but that price bump is worth it, in our opinion, when factoring in the sponge and warranty. The IndulgeMe is our runner-up choice among bath spa pillows. True to its name, Gorilla Grip’s spa bath pillow comes with 7 suction cups – the most we’ve reviewed of any pillow thus far – ensuring it’ll never slip from the hot tub. Sharing a similar construction to both Kleeger’s and IndulgeMe’s hot tub pillow, this pillow comes in both a two-panel and three-panel design, depending on the version chosen. With more suction cups than any of the other pillows on our list, the Gorilla Grip is super stable, and super comfortable! The additional suction cups make it ideal for spas that have an unusual shape or odd angles. These pillows come in a multi-panel design, similar to Kleeger’s and IndulgeMe’s pillows, which aids in comfort and flexibility. While the cushion is not made of antibacterial mesh, most buyers have not run into issues with mold or mildew with this pillow. Just be sure to give proper care and cleaning every few weeks like you would with any other hot tub pillow. And, if you choose the premium model, you can simply throw it in the washing machine for super easy cleaning! Between the 2” of foam padding, multi-panel design, and 6 or 7 suction cups depending on the model chosen, Gorilla Grip’s bath pillows have come in at the top of the ratings. These are the best hot tub pillows around! 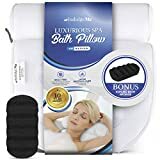 Overall, the best hot tub pillows we reviewed were Gorilla Grip’s original spa bath pillow and IndulgeMe’s bath pillow and Konjac bath sponge. Gorilla Grip exceeds by providing the basics exceptionally well: a multi-panel design to increase comfort and a high level of sturdiness (with 6 or 7 suction cups). IndulgeMe’s hot tub pillow has a similar panel design but also has antibacterial mesh. This mesh, when combined with proper care and cleaning, can extend the lifespan of the bath pillow. It’s hard to go wrong with either option.